I remember looking at the photo album filled with black and white pictures of Grandpa Clever and his four sons on their hunting adventures. The pictures were all black and white. Maybe they were too poor for colored pictures. By the time I was old enough to walk the fields for game. 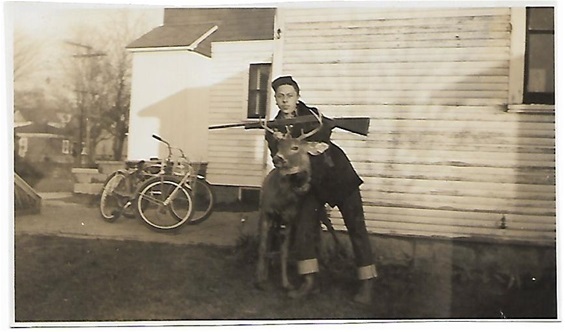 Grandpa had given up hunting. He was physically able to hunt, but chose not to do so. My Dad brothers and I spent wonderful days hunting pheasants, deer and grouse. These hunting adventures Grandpa could have enjoyed with us if he chose to do so. His lack of participation may have been the result of his involvement in an automobile accident, and law suit that threatened his work, income, and future earnings. Was he losing his eye sight? On my first deer hunt I was able to take an eight-point buck on a farm over the hill from our Lime Lake cottage. When I returned to our home in Blasdell, NY it was time to take more black and white pictures of the deer and the mighty hunter. My sister/cousin Karen and I decided to prop up the deer using a large wooden carpenter’s construction horse. Grandpa George came to see my deer and decided to help us stage the picture. As we struggled to place the deer over the wooden support stand for our photo Grandpa began to tell us a very special deer hunting story. Just as my deer was taken in an abandoned apple orchard, Great Grandpa also liked hiding in apple trees to ambush deer eating in apple orchards. The smell of fresh decaying apples is truly intoxicating for the deer. Rotting apples scattered on the ground around the tree make alcoholic cider. Stories are told of deer herds staggering drunk from eating too many fermenting apples. Grandpa continued his story as we worked to secure the deer for pictures. The thought of climbing into a tree to be out of sight and camouflaged on my next deer hunt was very appealing. There was more for me to learn about hunting in Grandpa’s story. My sister/cousin Karen and I forgot about arranging my buck deer for pictures and listened intently. Grandpa George straightened out my deer’s legs to make it look like it was standing. It was now held up by the large old wooden carpenters saw horse. Grandpa George paused his story long enough for us to think about the dangerous situation his father was in when the deer charged. Grandpa spit tobacco juice phlegm into the grass. Clearing his throat, he looked at each of us to be sure we were focused on his story and not the pictures we were going to take. Karen reached over to my buck’s horns grasping them with both hands. I could see she was trying to visualize the effort it would take for Great Grandpa to keep the deer from pushing its horns into his stomach while retrieving his pocket knife. Grandpa George studied her for a moment before continuing his story. “Freeing one hand, he pushed the deer’s horns away reached the pocket knife while. The buck continued to twist his head pressing home its razor sharp tines. The deer was winning this arm wrestle, and soon would poke holes into your Great Grandpa. The buck eased his pressure for a moment while fighting for better hoof purchase with its wounded and shaky legs. In that moment, my father grabbed the pocket knife, opened the blade, holding it ready for the next lunge by the deer. This time the wrestling would be a bit more equal. A knife is nothing if it is not sharp. Your Great Grandpa had a small sharp pocket knife. He fended off the buck with one hand while cutting through the deer’s thick black neck hair. The knife blade found and cut the vital deer carotid neck artery. The huge buck twisted to one side out of reach as it prepared for another charge. His charge never to come. The deer collapsed on the ground, legs kicking with a brain message to charge as the deer’s life blood flowed on the ground." We would remember, and our pictures were taken of my first buck deer.